14 pieces including a nice one. 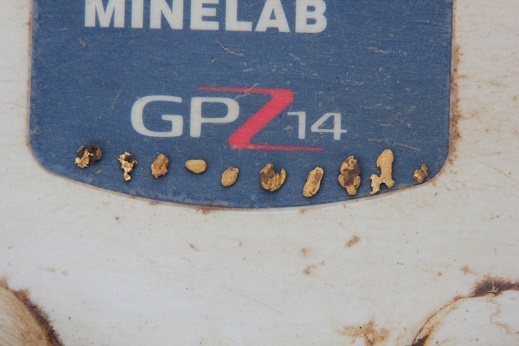 2 nice days out detecting last week. Tuesday was good with pieces popping up at regular intervals. 10 pieces for the day for 1.3 grams in total. 0.12 gram, 0.09 gram, 0.16 gram, 0.12 gram, 0.07 gram, 0.18 gram, 0.13 gram, 0.21 gram, 0.17 gram and finally 0.05 gram. On Thursday I tried another spot in the morning before I drove around for a little while looking for some more ground that may have been public land but it wasn’t.So I headed back to where I finished off last Tuesday. I was detecting away when I spotted a small area that looked undetected but I am sure I have put the detector over it several times over the last few years. I headed over to it and straight away I got a very good signal. This area is a couple of metres from a fence so my first thought was bits of fencng wire. It took a little while before the signal was out and as usual I go for the quartz rock and wave it over the coil and get a great signal. I inspected it but couldn’t see any gold so I gave it a wash expecting the iron to wash off the rock. Still a good signal so some more washing then out with the magnifying glass to see if I can see any visible gold but there was none. This rock is a bit bigger than the size of my fist and I give it a few whacks with the pick but no effect. When all the dirt is washed off the signal is still there and there is quite a bit of conglomerate in one spot of the rock. I have circled the conglomerate. After a few more whacks with the pick the quartz is in pieces but no more signal from it. I waved the coil over the ground and the signal is now on the ground. 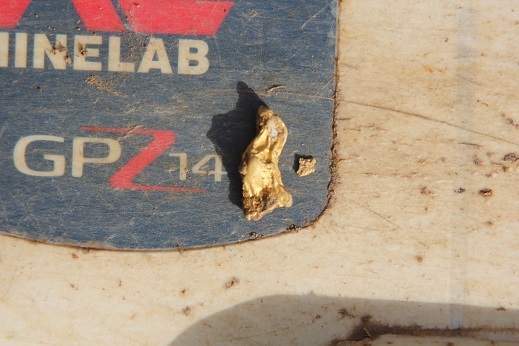 I get the piece and it is a rather nice bit of gold still with some conglomerate attached to it. 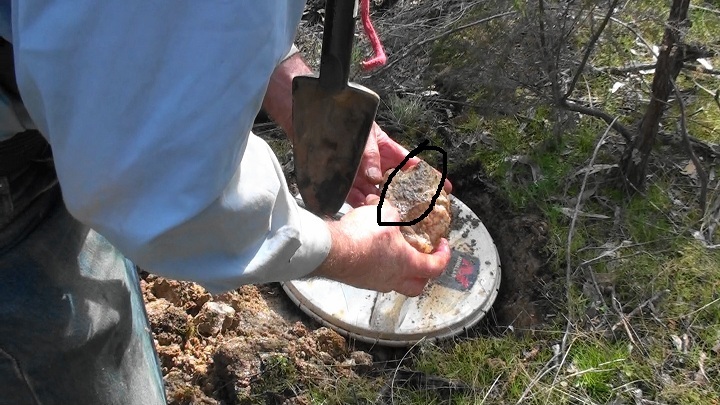 The nugget was stuck to the side of the quartz by the conglomerate. After it is soaked in acid and cleaned up it weighs in at 3.64 grams. It is one of the most beautiful pieces I have ever found. I got one more piece for the day but that was a measly 0.08 gram. So 3.64 grams and 0.08 grams. A good week and a very nice piece, my second one over a gram this year. Re: 14 pieces including a nice one. A ripper of a piece Axtyr. Top going, well done. Well done Axtyr, gotta love those multi gram pieces, to bad they only pop up now and again. Another good couple of days for you Axtyr. Congrats to you for your very nice finds and thanks again for sharing. Oh yes! Axtyr, you got that right, she's a beauty, great colour as well. Congrats, Harry. to get back out there. 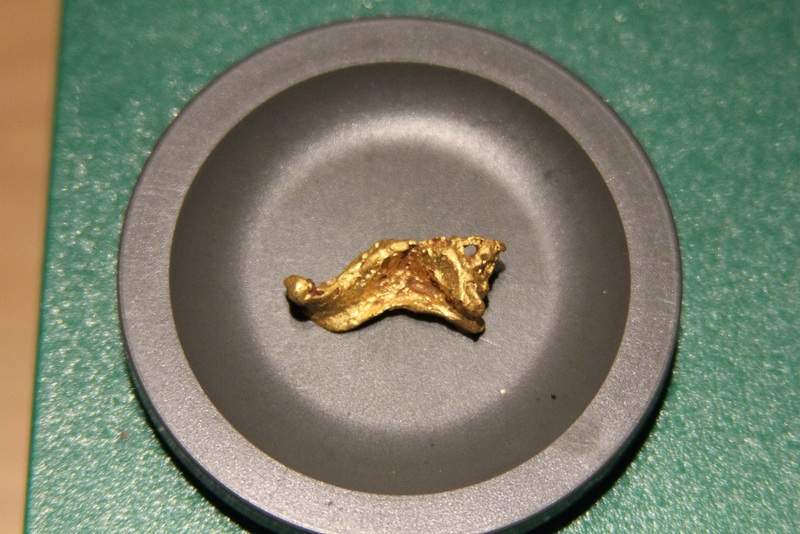 Great finds there Axtyr The 3.64 gram nugget looks like a harp? Great looking gold - Congrats! The biggie is a ripper.